The numismatic collection at the Gallery, at more than 120,000 objects, is by far the largest and most diverse held by any American university. It is displayed, in part, in a dedicated exhibition gallery and housed in the Bela Lyon Pratt Study Room for Numismatics. The numismatics room and gallery were made possible by a gift from a descendant of Bela Lyon Pratt, a Connecticut medalist and sculptor who studied at Yale, and one display case is devoted to his designs. Other cases explore the First World War through coins, medals, currency, and currency-related objects. Taken together, these cases offer the most extensive and comprehensive installation of numismatic material ever at Yale. The display is on view adjacent to the Bela Lyon Pratt Study Room, where visitors may make an appointment to view collection material. The Gallery’s collection of numismatic material is among the University’s oldest, dating to the early years of the 19th century. By 1863 the holdings numbered some 3,000 items; two decades later the Greek and Roman portions alone totaled over 3,200. Formerly known as the Yale Numismatic Collection, jurisdiction over it passed from the University Library to the Yale University Art Gallery in 2001. The collection now comprises over 120,000 pieces and is by far the largest assemblage at any American university. The collection provides the basis not only for formal instruction in numismatics but also for expanding the horizons of historians, art historians, archaeologists, and the general public. Its great strength remains Greco-Roman, including examples of the earliest coinage of western Asia Minor, the supreme artistic achievements of Syracuse and southern Italy, and masterpieces of Hellenistic and Roman portraiture. Silver coinage from the Roman Republic has been systematically acquired, and the collection of imperial coins is comprehensive; it has been augmented in recent years by the purchase of the collection of Professor Peter R. and Leonore Franke (over 4,100 pieces of Greek cities and the provinces) and the acquisition of roughly the first half of the collection of Ben Lee Damsky (about 900 pieces), which has enhanced the Gallery’s imperial holdings. The strengths of the collection include fine examples from the English and German traditions, a broad selection of Renaissance medals, and the coins from Dura-Europos, which complement the Gallery’s other holdings from this important Yale excavation in the 1930s. For the modern period, one of the most important single bequests was C. W. Betts’s collection of medals pertaining to the American Revolution, which was the basis of a scholarly study from 1894 that remains in use today. The collection also includes paper money, with many thousands of Confederate notes selected to represent virtually every issue of the Civil War period, as well as a superb run of Connecticut coppers from the 18th century. The numismatics collection has recently been fortunate to receive transformative support from Susan and John Jackson, B.A. 1967, and the Liana Foundation, which will see the department’s activities, and its holdings of paper currency and related artwork, expand exponentially. Now on view in the Bela Lyon Pratt Gallery is a selection of Arab-Byzantine coins, part of an extraordinary collection given to the Gallery in 2016 by Nobel Laureate and Yale alumnus Murray Gell-Mann, B.S. 1948, Hon. 1959. Since historical documentation of the early Islamic period is scarce, coins offer valuable insight into the economic, political, social, and religious aspects of ancient life during the rise of Islam and its spread throughout Byzantium and the Near East during the seventh century A.D. The coins on view reflect the evolving iconography of the period. For example, unlike later Islamic art, which prohibited the use of figural representation, the coins struck under the Umayyad caliphate (A.D. 660–80) appropriated ruler imagery from Byzantine coins while adding Arabic script, as seen in the coin shown here. Later, Abd al-Malik (r. A.D. 685–705) introduced new figural types on his coins, such as an image of the standing caliph holding a sword. After the coin reform of A.D. 696, which prohibited the use of images, coins bearing only Arabic script were issued. The Gell-Mann gift consists of more than 1,300 Arab-Byzantine coins and includes examples of all known types; with this gift, the Gallery’s collection of this material rivals those of other leading institutions. 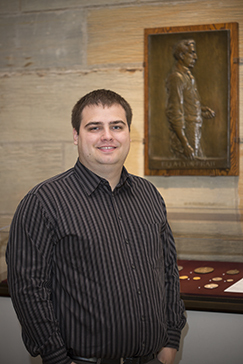 Benjamin Dieter R. Hellings, the Ben Lee Damsky Assistant Curator of Numismatics, joined the Gallery in late September 2016. He holds master’s and doctoral degrees from the University of Oxford, where his research focused on coin find patterns and the use of Roman coinage in northern Europe. He has published on a wide range of numismatic subjects, from Greek and Roman coinage to early American colonial coins and American bank note material. He is especially interested in the quantification of ancient coin production and the economy, the circulation and use of ancient coins, and the use of numismatic “big data” for research and teaching, as well as in proof bank notes and related material. Bellinger, Alfred R. The Coins. New Haven: Yale University Press, 1949. Bellinger, Alfred R. “The Numismatic Evidence from Dura.” Berytus 8 (1943): 61–71. Bellinger, Alfred R. “The Syrian Tetradrachms of Caracalla and Macrinus.” American Numismatic Society Numismatic Studies 3 (1940). Hellings, Benjamin Dieter R. “An American Bank Note Company Collage.” Yale University Art Gallery Members Magazine (Spring 2018): 12. Hellings, Benjamin Dieter R. “Ben Lee Damsky’s Collection of Miniature Monumenta.” Yale University Art Gallery Bulletin (2018): 74–79. Hellings, Benjamin Dieter R. “The Mary Hyde Ottaway Collection of Ancient Coins.” Yale University Art Gallery Bulletin (2017): 97-101. Hellings, Benjamin Dieter R. “(Re-)Discovery: Yale’s Second and Third Noe II-A New England Shillings.” Journal of Early American Numismatics 1, no. 1 (2018): 67–73. Hellings, Benjamin Dieter R. “The Susan and John Jackson and The Liana Foundation, Inc., Numismatic Collection.” Yale University Art Gallery Bulletin (2018): 48–55. Metcalf, William E. “The Ben Lee Damsky Collection.” Yale University Art Gallery Bulletin (2008): 95–105. Metcalf, William E. “Hadrianic Novelties.” Yale University Art Gallery Bulletin (2011): 42–47.